This story appeared in the January 2009 edition of Blackhawks Magazine, the official game program of the Chicago Blackhawks. Get the Stan Mikita Heritage Night edition at the Blackhawks' Dec. 16 game vs. St. Louis or by calling the Blackhawks Store at 1-800-GO-HAWKS. “What’s a Blackhawk?” the boy asked. “They’re a hockey team,” explained Mikita. The humble Mikita, 68, loves that story; the six-time First Team All-Star and Stanley Cup champion, who is second in Blackhawks history for goals scored (541) and first in individual assists and points, is known to a young generation of moviegoers not as a hockey legend, but as a star of “Wayne’s World” and “Wayne’s World 2,” the 1992 and ’93 comedies featuring Mike Myers and Dana Carvey. It was actually Mikita’s name and image, rather than his brief appearance, which made him famous. 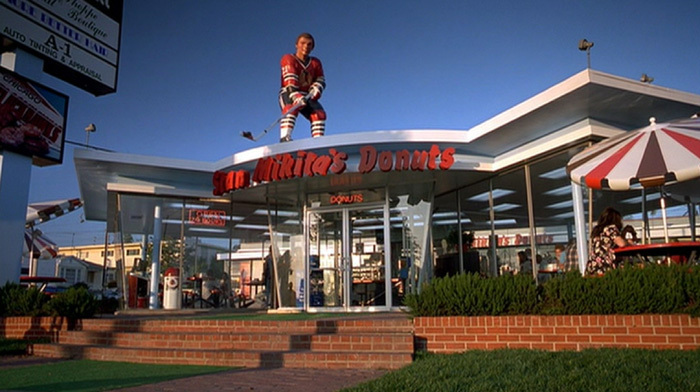 In both movies, much of the action takes place at Stan Mikita’s Donuts, a fictional coffee shop in Aurora, Ill., that has a 12-foot Stan Mikita statue in full Blackhawks gear on the roof. 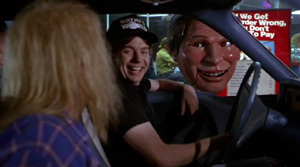 In Wayne’s World 2, Mikita’s head and mouth (“my big head and mouth,” says Mikita) greet customers at the drive-through and take orders. A month later, Paramount called back with good news: They were flying Mikita to Los Angeles for two days of filming. The movie was originally going to be set in Aurora, Ontario, Canada – Myers hails from nearby Scarborough and Michaels is also Toronto-born – and the donut shop scenes were going to be set at Tim Hortons, the famous Canadian coffee shop chain founded by the late NHL player (Mikita knew and played against Horton for nearly a dozen years). 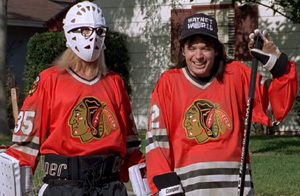 But when the producers decided that most of the “Wayne’s World” audience would be American, they scoured the U.S. for another Aurora location. When they discovered that Aurora, Ill., was just outside Chicago, they deemed the site perfect: They could keep the hockey theme by renaming the coffee shop for Blackhawks icon Stan Mikita. “So they sent me a first-class seat and had a limo pick me up at the airport, took me to the Four Seasons and gave me a big suite,” recounts Mikita, who arrived around 10 p.m. Los Angeles time for filming. He was so excited he couldn’t get to sleep, so he went downstairs for a beer. He finally fell asleep upstairs but was awakened at 3 a.m. by a phone call. “I thought, ‘Oh no, something happened at home’ but it was Paramount studios. ‘Hi Mr. Mikita, sorry to bother you,’ said a woman. ‘I just wanted to let you know that you don’t have to be on the set until 11 a.m.’” Mikita couldn’t get back to sleep and by 8 a.m. made his way to the lobby. “‘Mister was my father, my name’s Stan,” replied Mikita. They did another take, but the scene didn’t get into the movie. What did was a quick shot of Stan sitting at the counter, talking to a young woman and autographing a picture while actor Ed O’Neill (who at the time was starring in “Married with Children”) put a coffee pot on the burner. When shooting was finished, Paramount offered to buy a first-class ticket next to Mikita so he could take the 12-foot, styrofoam Stan statue home. Mikita declined the offer, but a few months later he got a phone call from “MacGyver” star Richard Dean Anderson. The Minnesota-born actor, who’d once dreamed of playing pro hockey (until he broke both arms) and had played with Mikita in celebrity fundraisers, had seen the giant Mikita at Paramount and asked if he could have it. “I found out later that he brings it outside and plays street hockey with it. He’s a hockey nut and a pretty damn good hockey player. God bless him that someone’s getting a kick out of it,” muses Mikita. “Wayne’s World” went on to earn $200 million in combined box office and video sales. 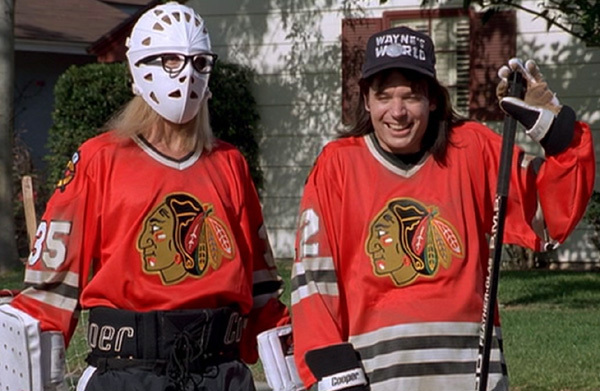 Thanks to both his and the movie’s popularity, Mikita got another phone call from Paramount, asking to use his likeness in “Wayne’s World 2.” Mikita was paid about $1,000 for the first movie; his head and mouth in “Wayne’s World 2,” however, put two of his four children through college.